Maggie Smith shines in one of her most out-there roles to date. Given some of the serious topics addressed, to some degree, over the course of The Lady in the Van — homelessness, religious oppression and mental illness, for starters — it's a wonder that watching the film is such an enjoyable experience. Not to mention an uplifting one. Credit here goes mostly to Maggie Smith, the beloved British actress with an incredible range of facial expressions that she uses to convey the conflicted inner life of Margaret Shepherd, the title character of this based-on-a-true story. Or perhaps her name is Mary? We're never quite sure for much of the film. 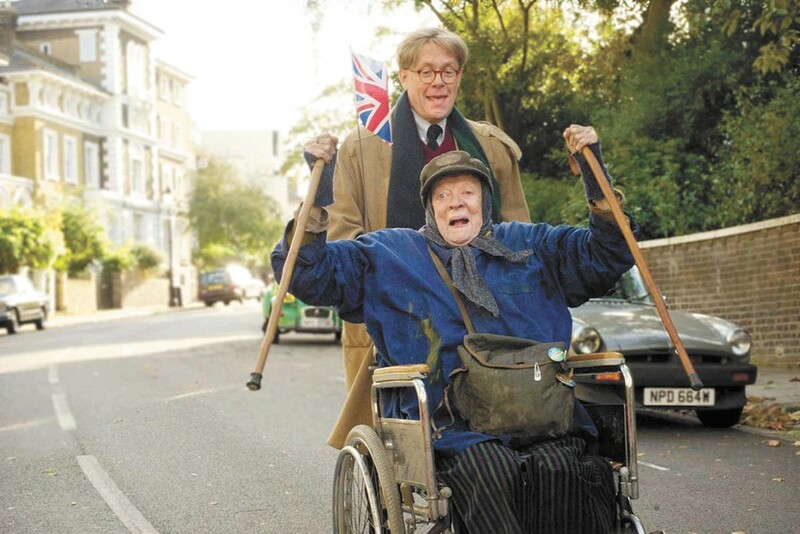 Part of the appeal of The Lady in the Van is being privy to the mystery presented by playwright Alan Bennett (Alex Jennings) as he tries to learn about the woman he (sort of) befriends and (kind of) welcomes to live in his driveway — a relationship and living arrangement that eventually lasts more than 15 years. The movie cleverly presents Bennett as two characters, the writer and his conscience, and the inner debate he has about treating the odd woman outside his flat as a human in need of help, or merely a source for entertainment that will fill a new play, is one we share as a viewing audience. Are we watching this woman who's clearly been beaten down by life as mere fodder for a laugh, or are we witness to the slow, steady disintegration of a person's dignity? Ultimately, it's a little bit of both. But Smith is so good, and the relationship between her and all those she comes in contact with so spirited, that we never feel Bennett's "guest" is being taken advantage of, even as we laugh at her odd predilection for painting everything yellow, or the faces people make when the scent of the van's interior makes its way out during one of her brief moments of throwing open the doors. As we slowly learn more about Margaret's past, the plight of her living situation seems all the more tragic. But The Lady in the Van never wallows in sadness for long, thanks to a steady stream of subtle jokes and touches that are utterly charming, from Bennett's series of one-night stands with actors from his plays to Margaret's occasional forays to a seaside town, where she recaptures some of her childhood with merry-go-round rides and ice cream sundaes. The Lady in the Van is not showing in any theaters in the area.